Welcoming a new era in its history, TVR has unveiled its all new sports car, the TVR Griffith, at the Goodwood Revival. Revealed to media and visitors, the Griffith is the first new TVR to be launched since the company was resurrected in British hands. The new Griffith stays true to the brand’s rich heritage, while employing cutting-edge engineering. The exterior has been designed to be as striking as it is aerodynamically efficient. The timeless sports car silhouette is accented with deep air intakes, generating high levels of downforce and cooling. Embodying TVR’s long-standing ethos of the Sprit of Driving – the principle of delivering an involving driving interface where the driver will always be fully in control – the new Griffith uses intelligent engineering over electronic driver aids. 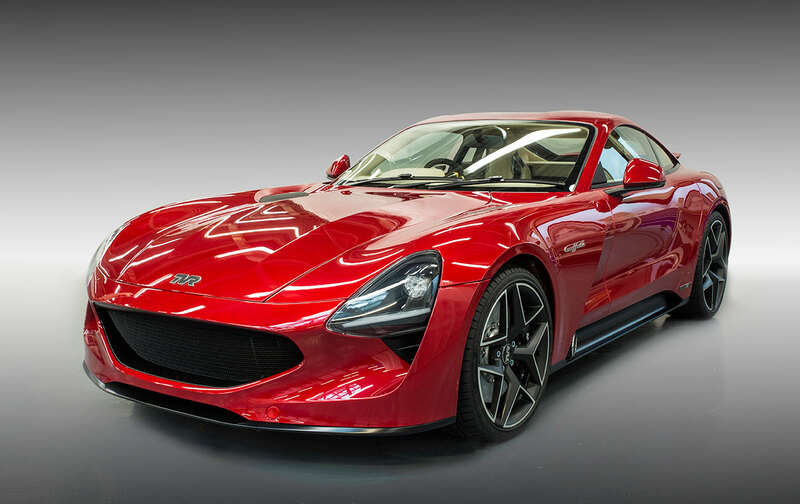 Only the second front-engined production car to feature a flat floor, the new TVR Griffith boasts a full ground-effect aerodynamic package to ensure that the car remains stable at high speeds and delivers exceptional handling abilities. Employing Gordon Murray Design’s innovative iStream architecture with carbon composite structure and body panels, the new TVR Griffith weighs just 1250kg, offers exceptional torsional rigidity and a perfect 50:50 weight distribution. Powering the new TVR Griffith is a naturally aspirated 5.0-litre Cosworth-enhanced V8, which enables 400bhp/tonne and is mated to a six-speed manual gearbox. The new TVR Griffith achieves a top speed of more than 200mph, and accelerates from 0-60mph in less than four seconds. The new TVR Griffith unveiled to the public is presented in Launch Edition specification, which includes a full leather interior and custom alloy wheels, as well as Launch Edition paint options and a bespoke infotainment system. Starting from £90,000, production of the new TVR Griffith Launch Edition will begin in late 2018. TVR is also previewing the new Griffith in a striking pace car livery, signalling the brand’s intention to return to the racetracks of the world in the very near future.